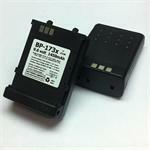 BP-180xh : 7.2 volt 1450mAh rechargeable Ni-MH battery for ICOM radios. Fits IC-W32, W31, T7, Z1, etc (worldwide versions). ENHANCED DESIGN ! 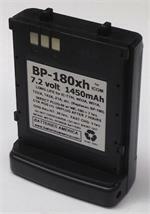 BP-180xh: 7.2 volt 1450mAh rechargeable long-life NiMH battery for ICOM radios, such as the IC-W32A/E, IC-W31A/E, IC-Z1A, IC-T7A/E (worldwide versions). 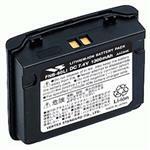 BP-272LH: 7.4 volt 2270mAh rechargeable long-life Li-ION battery for ICOM ID-51A, ID-51A Plus, ID-31A, ID-51E, ID-31E (D-STAR; all worldwide versions). Replaces original BP-272, BP-271. 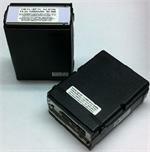 PB-14x : 12 volt 700mAh rechargeable Ni-MH battery pack for KENWOOD radios such as TH-27A, TH-28A, TH-48A, TH-78A etc. Extends length of radio by 3/4". Provides high-watt power. Recharges in desktop fast charger, or with Wall Charger. 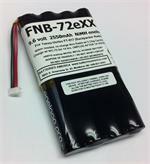 BP-200XL : 9.6v 1450mAh LONG LIFE Ni-MH rechargeable battery for ICOM radios. Fits IC-T8A, IC-T81A, IC-A23, IC-A5, etc. Charges thru the radio (slow), or in the EMS-30i. 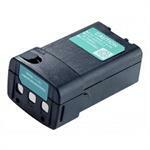 BP-131exx: 7.2 volt 2550mAh ENELOOP NiMH rechargeable battery for ICOM. Fits IC-W21A, IC-2GXAT, IC-V21AT, IC-M10A, IC-F10, IC-F20, etc. Arrives PRE-CHARGED & READY TO USE. Retains its charge when not in use! 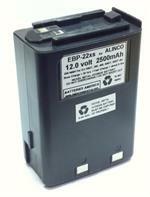 BP-132xxe : 12 volt 2550mAh long-life rechargeable eneloop Ni-MH battery for ICOM HT radios. BP-132xxe : 12 volt 2500mAh long-life rechargeable eneloop Ni-MH battery pack for ICOM. Arrives to you PRE-CHARGED and READY TO USE. IC-W21A, IC-W21E, IC-2GXA, IC-2GXAT, IC-V21AT, IC-F10, IC-F20, IC-M10, etc. 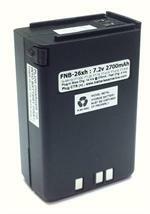 BP-196xh : 9.6 volt 2700mAh ULTRA LONG LIFE rechargeable Ni-MH battery pack for ICOM radios. Includes Belt Clip. Replaces original BP-195 or BP-196. Extended operating time, memory free!